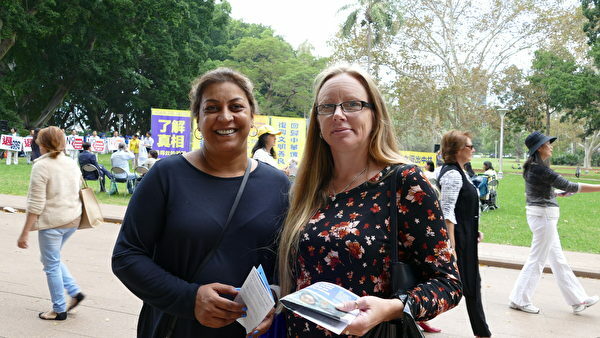 As more and more Australians continue to stand up to and speak against the infiltration and influence of the Chinese Communist Party (CCP) overseas, a grassroots movement against the Chinese regime continues to gain momentum in China. Since The Epoch Times published The Nine Commentaries on the Communist Party, more than 300 million oppressed Chinese people have renounced their ties and quit the CCP. On April 21, supporters of the Quit CCP movement gathered in Sydney’s Hyde Park to celebrate this milestone. Despite having been propagandised from a very young age, or from birth, the Chinese people are waking up to the true nature of the CCP, which was in part inherited from the Soviet Union and has brought nothing but bloodshed and sorrow to the people of the Middle Kingdom since its inception. Paul Folley, general manager of the non-profit Australian TFP, represented his organisation at the event and expressed his support, “I think we are seeing a historical moment. We are seeing what I believe is the collapse of the Communist country. “I believe, as it does more and more human rights abuse in China, the Communist [party] will collapse. Because such an artificial, evil system … regime cannot last forever. It’s impossible. “I don’t believe China needs Communism to be a great country. If China was free and was allowed to be free, the Chinese will be great people anyway. Folley believes that the huge number of Chinese people freely choosing to sever their ties to the Communist Party carries an important message for Australians: that most Chinese don’t want to be under the CCP’s control. Australian Tibetan Council member Kyinzom Dhongdue said that, as a representative of Tibetan community in Australia, she supports the Quit CCP movement. “People in China – people who seek truth and freedom, democracy, human rights – we should not give up. When we combine all forces together, we can win,” she said. “The Chinese Communist Party has oppressed millions of Chinese people in China. China today is spending more on internal security than its national defence. “Without the foundations of these basic principles … freedom and human rights in the societies like China, the government cannot last forever. The Lord Mayor of Parramatta Council in NSW, Andrew Wilson, showed his support at the event. “It is a good thing. I am hoping for peaceful change in China,” Wilson said. Also in attendance, Secretary-General of the Vietnamese Association in Australia, Thuy Dinh Tran, said that the Quit CCP movement is very encouraging. “This is the beginning of the end of the days for the Communist regime. The Communist regime has thrived on lies, tricking people to believe what they are doing is right, hiding all the acts of criminal activities like murders. “People are starting to see the truth of the Communist Party, and [that] their economic prosperity is based on killing human beings … based on those criminal activities which cannot last forever. “I think this movement is good, the future is good for China and Chinese people and for many other people around the world who are under the Communist regime. “By your action of quitting the Communist Party, you give us hope. You give hope to many other countries who are under the dictatorship of the Communist Party. Emeritus Professor David Flint, who was unable to attend the event, sent a message of support, which spoke highly of those 300 million people who had quit the CCP. “Courage is a virtue which we Australians especially appreciate – whether it is in war time or in events in peacetime where men and women show selflessness and bravery in the service of others. “As the American Declaration of Independence states, Man has been endowed by his Creator with certain unalienable Rights. “This principle applies to all people, including those who live under the authoritarian one party rule in China. “That some stand up for this by abandoning membership of the ruling party is an act of bravery and must be saluted and encouraged by all in free countries and by their elected representatives, especially those in government. Retired veteran Mr Hu Wei, who had previously served in mainland China as platoon leader, company leader, and staff officer of the army, shared his story of using his real name to quit the CCP on The Epoch Times’s website instead of an alias. At the event, he encouraged more people to step up and cut their ties to the CCP, so they could regain control of their own freedom. The Sydney representative for the Global Service Centre for Quitting the Chinese Communist Party, Mr Li Yuan Hua, explained that there are many centres that assist Chinese people to quit the CCP. “In Sydney, there are more than a dozen such centres servicing local Chinese people and tourists from mainland China. The volunteers for these centres work rain, hail and shine to spread the truth, in order to awaken Chinese people’s conscience, so that they may renounce the CCP. He says that this Quit CCP movement has liberated Chinese people’s spirits from the control of the CCP, and has invaluable contributions towards rediscovering traditional roots, returning to humanity, and rebuilding the relationship between man and divinity. The number of people who have withdrawn from the CCP reached 300 million on 23rd March 2018, and continues to increase at a rate of 100,000 persons per day.